These two men have a lot to answer for…. Almost every UK RPGer’s who started in the 70s/80s, have these to men to credit. 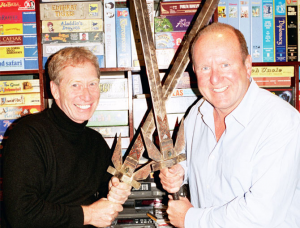 Steve Jackson (left) and Ian Livingstone (right) where the founders of Games Workshop and brought D&D and many other RPGs to these shores, as well as authoring the original Fighting Fantasy books. Last UK Games Expo they did a talk called “An Illustrated History of Games Workshop and Fighting Fantasy” which my friend Paul of Cthulhu recorded for yog-sothoth.com recorded for your listening pleasure. Also worth noting this online interview with the duo, covers pretty much the same territory. This entry was posted in Dungeons And Dragons, Fighting Fantasy, Heroes of UK Oldskool by Newt. Bookmark the permalink. Nice one! I was in the audience for this, didn’t know it had been preserved for posterity!